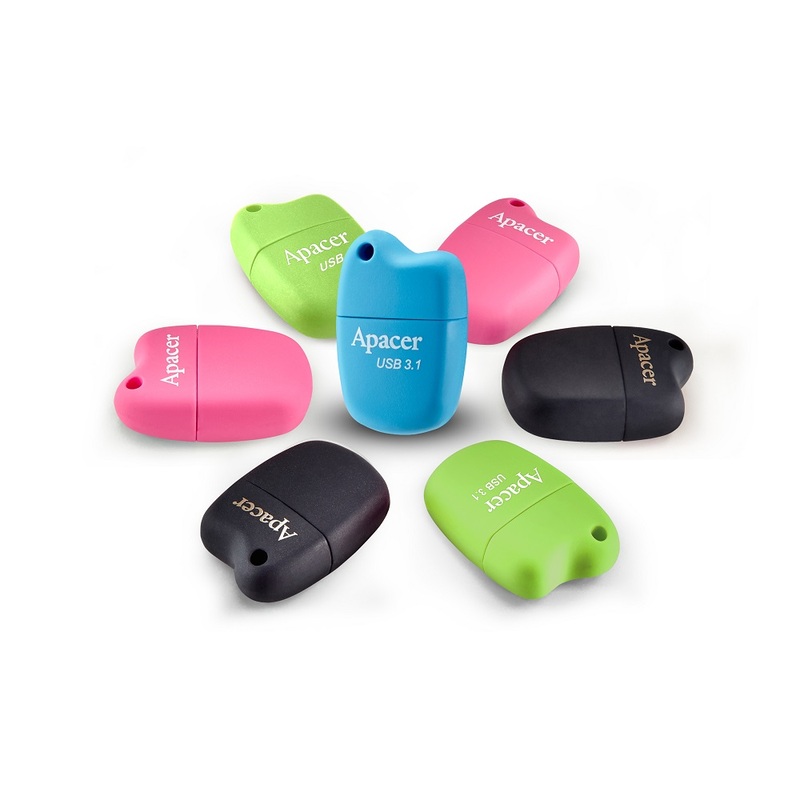 Digital storage device leader Apacer introduces a fun series of super-mini USB flash drives: AH159, a USB 3.1 Gen 1, and AH118, a USB 2.0, all smartly designed with a stay-on protective cover that ensures the port can be kept insulated after usage. Behind the rounded shape and the vivid colors of these neat, lively forms lie durable protections that guard against water, dust, and shock. Equipped with SuperSpeed USB 3.1 Gen 1, AH159 reads and writes at a lightning speed, making file access a pleasant and breezy experience. AH159 and AH118 are the latest additions to the Apacer super-mini flash drive family. The rounded silhouette on the exquisite appearance sports a flexible rubber case that is made from environmental-friendly material, which offers a supple finger touch with sufficient friction to make the insertion and removal from USB socket effortless. What’s more, the dustproof, waterproof, and shockproof functions will provide an all-round protection, guarding everything stored inside. AH159 is a USB 3.1 Gen 1; the exterior bears a vibrant sky blue, coupled with aptly sized white letters that add a refreshing touch to the entire unit. AH118, a USB 2.0, is available in two colors: brink pink and black. The cloud-like shape at the tip adorns the design with a dynamic form. The attached chain comes with a mini rubber piece also shaped like a cloud to function as a cap holder. Simply insert the mini rubber cloud into the cap during use to prevent from lost. Hook the chain onto your most important personal belongings like bag or key ring, so that it will always be conveniently available for use. Both AH159 and A118 come with multiple memory capacity choices, from 8GB, 16GB, 32GB, to 64GB, which can hold up to 16,000 high resolution images or over 800 minutes of Full HD video. Need to boost memory on your ultra-thin laptops or Macbook? Look no further! Let AH159 and AH118 accessorize your computers with a sleek, fun style.